Unleash the muscle-building power of protein by using products that contain Velositol. As anyone from Walter White to the founder of Papa John’s will tell you, a product is only as good as the ingredients inside it. Use subpar ingredients and the end result will be, well, subpar. On the other hand, mix in a game-changing ingredient, and the product has the potential to become something truly special. If this ingredient is blended into a training supplement, it can help you break through plateaus in the gym and take your physique to astonishing levels. Velositol, a revolutionary creation from Nutrition 21, appears to be such an ingredient. What makes Velositol so effective? Here are six ways it boosts your body. 1. IT DOUBLES THE POWER OF PROTEIN. A recent study shows the dietary complex of amylopectin and chromium in Velositol doubles the muscle protein synthesis (MPS) rate compared with what was seen with whey protein alone (when combined with 6 grams of whey protein). 2. IT ACCELERATES AND BOOSTS MUSCLE PROTEIN SYNTHESIS. MPS starts immediately after you begin exercising and can continue for as long as 48 hours post-workout. Velositol is designed to boost the increase in MPS from protein intake and exercise. 3. IT ENHANCES INSULINOGENIC FUNCTION. Velositol's novel dietary complex of amylopectin and chromium supports greater amino acid uptake into muscle cells and stimulates muscle protein synthesis. 4. IT PROMOTES LEAN BODY MASS & SUPPORTS QUICKER MUSCLE RECOVERY. By enhancing protein's power, Velositol also activates mTOR, a cellular protein that plays a vital role in building lean body mass. So Velositol doesn't just help you pack on muscle, it also assists you in sculpting a ripped, lean physique. By increasing muscle protein synthesis, Velositol improves the body's ability to repair muscle damage due to exercise, thereby speeding up recovery. Which is good news for lifters of all ages. 5. IT WORKS IN A SINGLE DOSE. In a pre-clinical study, Velositol was shown to increase MPS after a single dose (when combined with 6 grams of whey protein). This is a major finding, because it means you don't have to take this ingredient for weeks and weeks to start experiencing its muscle-building benefits. 6. IT HAS BEEN SHOWN TO WORK WITH OTHER PROTEINS AND AMINOS. 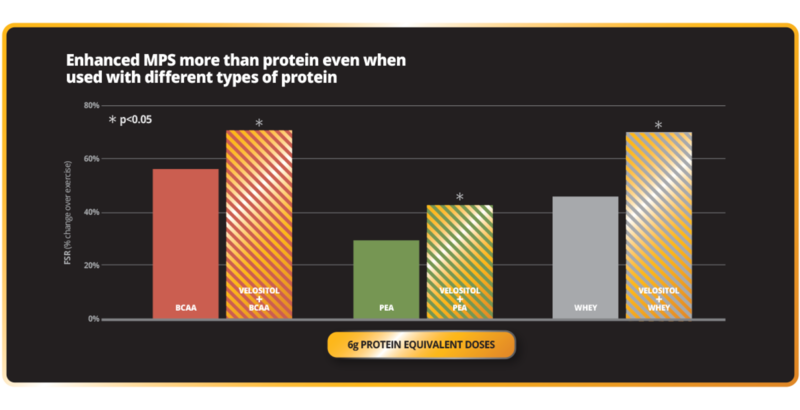 Velositol enhanced MPS due to whey protein, pea protein, and BCAAs, providing evidence that the results reported from the pre-clinical study can also be applied to other proteins or sources of amino acids. NOTE: Velositol was determined to be safe at the recommended serving of 2 grams per day in protein drinks, meal-replacement bars, energy bars, and protein bars. Sponsored by Velositol®. *These statements have not been evaluated by the Food and Drug Administration.These products are not intended to diagnose, treat, cure, or prevent any disease.